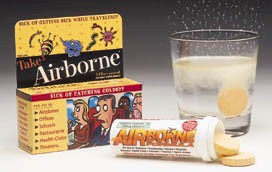 Don't you love it when you get on a JetBlue plane and drop a germ-fighting Airborne tablet into a glass of water, only to be later approached by policemen with assault rifles and shoved against a jetway wall? Oh, maybe it's never happened to you, but it happens. OFFICER: A passenger saw you doing something suspicious. DAVID: Mixing something...? It's Airborne! OFFICER: What's airborne right now?! DAVID: No! the cold medication you take when you go on an airplane! At which point they should've started trying to poke each other's eyes.